Get ideas for how to decorate with them, how to grow them, and trivia about them. I just bought my Christmas poinsettias for this year ( 2012) and got a great deal at Home Depot. A nice, full, six inch pot for less than $5.00 and a very full planter of poinsettias plus variegated ivy for less than $15.00. 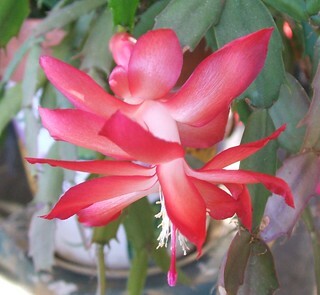 Home Depot also had Christmas cactus, which I thought about getting... but decided I wanted to wait until later. Christmas plants are a big part of the holiday for most of us. Whether it is decking the halls with bright poinsettias, or making special table centerpieces for a holiday meal, there are opportunities to use these special accents in creative ways throughout the season. Maybe that is one reason why giving a Christmas plant is popular. I have to admit to gifting myself with Christmas season plants! I love Rosemary "trees", and even found my favorite Hellebores (which went into my garden the following spring) during a lucky shopping foray into the grocery store holiday gift plant department. I have collected a number of plant articles that cover the topic of Christmas plants, from bloomers to living Christmas trees to help you make the most of your Christmas season greenery and flowers.